Honestly, it was Saturn that started it for me. The first time I looked through a little 3″ refracting telescope, and saw Saturn’s rings – not in a picture, but real, live, right there… That was what started an interest in astronomy for me. My fascination with Saturn is still there. Now, some my argue that I’m a week early, since opposition isn’t until June 15 (the point at which Saturn is directly opposite the Sun, and so at its fullest and brightest). I’m sure we’ll see a lot of breathless articles about the 15th being the one and only night to see Saturn in its glory – but it’s there now. By the time it’s gotten good and dark, about an hour after sunset, Saturn is high enough in the east to put on a good show. And it’s just getting better every night – look at the full Moon on the 8th (Thursday), and you’ll see the red star Antares, the head of Scorpio, below and to the to the right. Completing the triangle, below and to the left, you’ll see Saturn. The next night, Friday the 9th, the Moon will appear right next to Saturn. Saturn is big, it’s bold – it’s the furthest thing away in our solar system that can be seen with the naked eye. It’s moons aren’t as bright and obvious as the four Galilean moons of Jupiter, but Titan, Saturn’s largest, is easily visible. Here’s a good link showing the relative positions of Saturn’s moons at any given time. The real show-stopper, of course, is the ring system. From our vantage point, Saturn is tilted toward us, and it appears as if we’re looking slightly down on the planet, the rings very “open” (tilted about 27 degrees down on the side towards us – or up if you’ve got an inverting telescope). In very small scopes, this gives the effect of a planetary disk with “ears” – little extensions to each side. But even a small scope will show the rings clearly enough to see dark space between them and the planet – just as I did many, many years ago, when I first started to be interested in what was out there. Over the next few months, Saturn will be getting higher and higher, and for a good while, we’ll have both it AND Jupiter sharing the sky. Get out there and take a look. You won’t regret it. I know die-hard astrophotographers will disagree, but oppositions for both Jupiter and Saturn don’t mean a whole lot beyond the time keeping of the seasons best to view them. They are too far away to make a whole lot of difference. Same goes for Uranus. Mars, on the other hand, is a different story. You definitely want to view Mars at opposition and during the proximate days and weeks. Great post… it’s funny. I can see Saturn plain as anything, as I think anyone with a bunch of with it can, but I’ve talked to a bunch of people, and there’s a general sense of… underwhelmed confusion about Saturn, at least with the naked eye. I remember that from when I was first starting out, too. It’s never as bright as people want or expect it to be. Compared to Jupiter or Venus, it’s espeicially muted. Once you see it, though, wow. Absolutely, it’s so understated to the naked eye, but realizing you can see those rings even with a modest telescope is an eye- opener in every sense. Disbelief and wonder that these things are actually accessible. Yeah. I still remember the first time I saw those rings with my own eyes. Amazing. I remember Galileo said something about how Saturn had “ears.” I never understood how the rings could look like ears until the other night. When the rings are tipped this far toward us, they really do look ear-like. “The first time I looked through a little 3″ refracting telescope, and saw Saturn’s rings – not in a picture, but real, live, right there… ” wow same experience here. 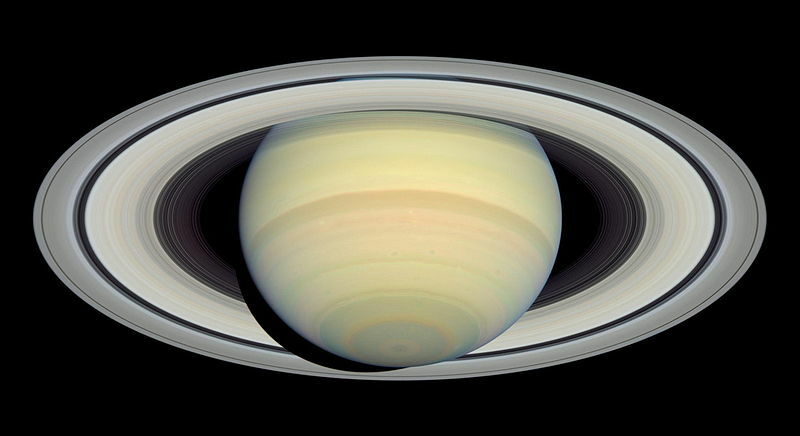 Saturn is beautiful! Not much time left to see it (and the ashes of Cassini) this year.